Seat Sale fares as low as PhP299 for local destinations and US$79 for international routes! Take advantage of the Philippine Airlines year end seat sale now! Until Nov. 25 only. 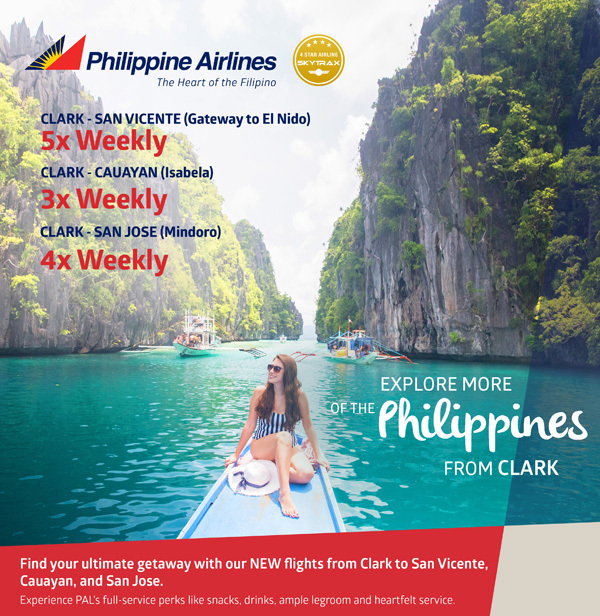 Philippine Airlines domestic flights from the Clark Hub. 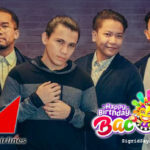 Philippine Airlines (PAL), the first and only 4-Star airline from the Philippines, gives Filipinos more reasons to fulfill their 2019 travel goals. With their Year End Sale that started November 10 until November 25, they are offering really low rates for travels from January 1 to September 30, 2019. PAL gives back to Filipinos by offering big discounts on over 40 international and over 30 domestic destinations. The flights will take off from the flag carrier’s four hubs in Manila, Cebu, Clark, and Davao. “Since PAL was awarded a 4-Star Full Service Airline rating in February, we have been busy making progress in our core missions. These are to continuously enhance our services, to build up a younger, stronger fleet of great airplanes, to expand our route network and reach more customers and more markets. This will make Asia’s First Airline one of the World’s Best. Now, it’s our turn to give back and share the excitement,” said PAL President & and Chief Operating Officer Dr. Jaime J. Bautista. One-way Economy base fares for local destinations will go as low as P299 for Cebu-Kalibo, Bacolod, Palawan, Cebu for as low as P999, Zamboanga for as low as P1999 and Davao and Kalibo for as low as P1399. 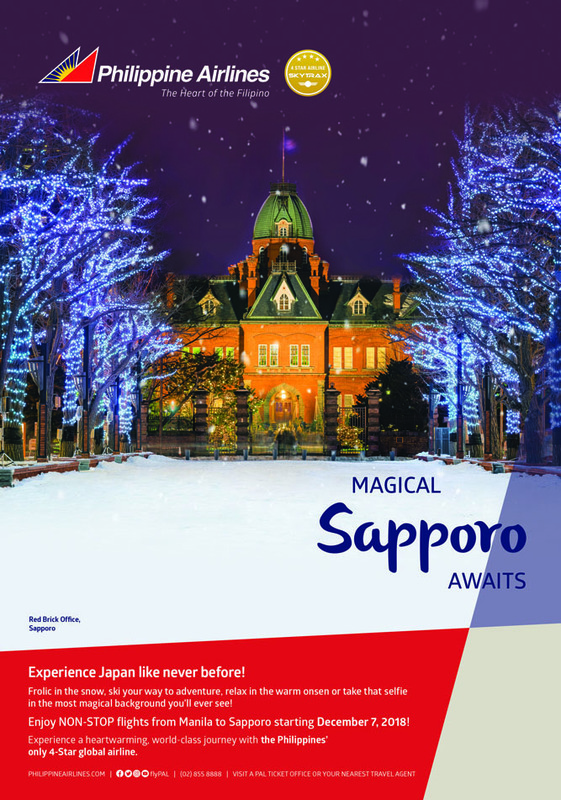 New destination by PAL– Sapporo, Japan. Flying December 7. 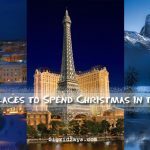 “We are giving Filipinos the chance to make their travel dreams come true this 2019. We are offering big discounts on our local and international destinations. Plus, we are offering great deals on our NEW Premium Economy and Business Class seats,” shared Ria C. Domingo, PAL Vice President for Marketing. 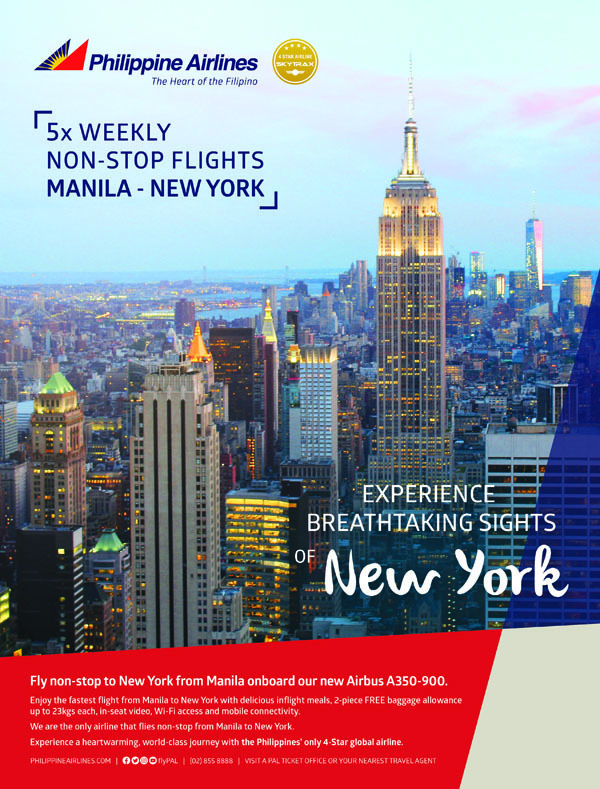 Fly non-stop to New York from Manila. PAL is also increasing their flight frequencies on key routes, providing passengers the increased flexibility to choose from a wider array of flight departure and arrival times for greater convenience. Economy Passengers can choose to elevate their flight experience with PAL’s NEW Premium Economy Class. Prices will start from USD289 for the Manila to Hongkong route. The NEW Premium Economy Class boasts of wider seats with 38 inches of leg room and up to an 8-inch recline. There will also be a bigger screen for in-flight entertainment and more baggage allowance for packing convenience. World-class luxury from the Philippines’ best can also be enjoyed on PAL’s Business Class, starting from USD389 from Manila to Taipei. Get sky-high comfort in exclusive Business Class cabins, while getting spoiled with full-course meals, and complimentary welcome drinks. Passengers will also enjoy state-of-the-art entertainment and a curated set of privileges. 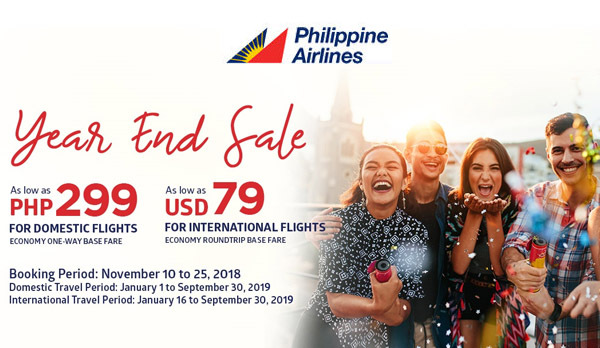 Travel Period for the PAL Year End Seat Sale is from January 1 to September 30, 2019 for domestic travels and January 16 to September 30, 2019 for international travels. The Philippine Airlines Year End Sale is available at any PAL ticketing office, PAL-accredited travel agent, or PAL Reservations. 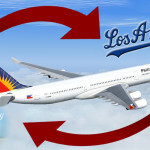 Call them at (02) 855 – 8888 or visit www.philippineairlines.com. The Bacolod Bloggers, a.k.a. Negrense Bloggers, were invited to cover the PAL Year End Party launch in Clark. We tried the direct PAL flight from Bacolod to Clark early in the morning. We stayed at Xenia Hotel Clark, a partner and official residence of PAL crew. 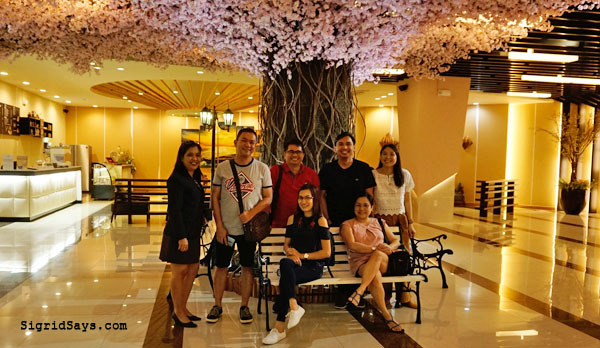 Bacolod bloggers at the Xenia Hotel with PAL Social Media Marketing Officer Jed Menes. We tried the Clark hub and covered the PAL Year End Seat Sale event. The party was held at the Charley’s Bar of Quest Hotel in Clark. Sigrid Says in Clark, left at Quest Hotel and right at Xenia Hotel Clark, courtesy of Philippine Airlines. Seat sale continues until Nov. 25. With the PAL Seat Sale, you can easily visit Bacolod. 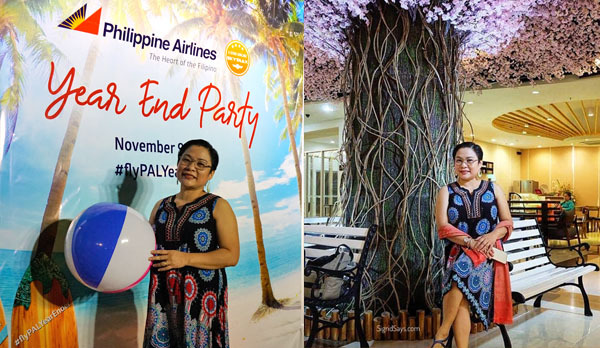 PAL flies to Bacolod daily, several times a day. These flights come in from Manila, Clark, and Cebu. Read more about the City of Smiles in my post, Bacolod City Guide. 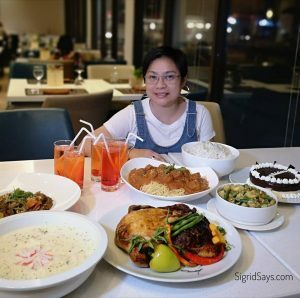 Explore our beautiful and peaceful city and enjoy the delectable dishes in our Bacolod restaurants. Also, please check out this post on Things to Do in Bacolod if you only have one day to spend here.